My already limited rate of reviewing books here seems to have slumped almost to a stop. From labouring under the sense, a few years ago, that I had to write about everything I read – that my experience with a book was in some way not finished, not processed, otherwise – I am now coming to understand that reading and running (as Salinger put it) is a reliable pleasure in itself. Nonetheless, occasionally I read a new book which I want to share, and that urge is compounded when the book comes after a run of duds. The more I read, and the older I get, the fewer qualms I have in chucking aside a book which isn’t pleasing me, and in particular which isn’t special or different or new. There are risks in this, of course – occasionally comes along a “masterpiece” which even some of its supporters say doesn’t really get going until the second half – but more often, the answer to the question “Does it turn into Tolstoy at page 205?” is pretty clear. So, having begun and abandoned a chain of much-touted new releases – a serial literary love-rat – I settled on this innocuous-looking collection. It turned out to be that rarest of pleasures: a book I loved, and could recommend to almost anyone. The Examined Life carries a manifesto in its title: if, as Socrates said, the unexamined life is not worth living, then examining a life must give it meaning – or return meaning to it. This examination, I presume, is how Grosz sees his profession as a psychoanalyst. I knew nothing about psychoanalysis before reading this book, and when I finished I bought Janet Malcolm’s Psychoanalysis: The Impossible Profession, but The Examined Life is a pretty good jargon-free primer in itself. There is plenty of respect for Freud, father of the discipline, and clear support for the psychoanalytical belief that childhood events are the engine of our development. Mrs C., who owned and operated a small restaurant with her husband … was a mother of three. She wanted help because she felt anxious and suffered panic attacks. In our first meeting she said that she found it ‘difficult to relate honestly’, but it was only after several months of therapy that she told me she was having an affair with her children’s nanny, a woman who had been working for the family for the past seven years, since shortly after the birth of their first child. Now – contrary to an agreement with her husband – Mrs C. was secretly trying to get pregnant because she could not bear the thought of losing her nanny. 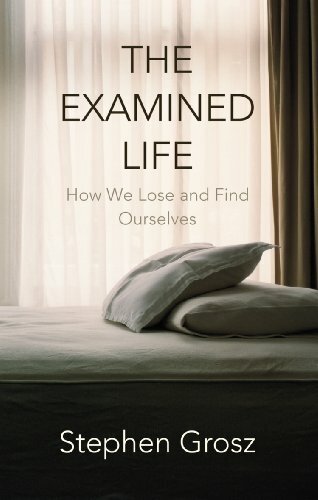 The subtitle of The Examined Life is How We Lose and Find Ourselves. This suggests that for each problem reported, there will be a solution. In a sense this is true, but the solution is not a plan of action; it is simply the discovery, acknowledgement and understanding of the nature of the problem. With Grosz’s voice – patient, paternal, wise – this becomes a seductive pattern, and after each account I was torn between the urge to guzzle another or – following Mavis Gallant’s advice not to read more than one story per day by the same writer – allow it to settle and mature before moving on. Without this, a child might come to believe that her activity is just a means to gain praise, rather than an end in itself. How can we expect a child to be attentive, if we’ve not been attentive to her? Being present, whether with children, with friends, or even with oneself, is always hard work. But isn’t this attentiveness – the feeling that someone is trying to think about us – something we want more than praise? These explanations – how obvious they seem! – felt life-changing to me, and the pleasure I took in this book went far beyond the literary. It is full of revelations to the uninitiated, such as the many ways the human mind has of deceiving us. We learn about ‘splitting’ – the unconscious strategy that places aspects of ourselves that we find shameful into another person or group (think of an evangelical preacher found cottaging, or indeed Sir Hugo Coal in Patrick McGrath‘s novel The Grotesque) – and about paranoia coming from the deep-rooted fear that nobody cares about us. There is, after all, only one thing worse than being talked about. There is a risk of Grosz coming over like Robbie Coltrane in Cracker, the superman who sees intuitively what nobody else does. But it is experience and interest in his subjects that gains him the key to each story – and not all the stories have a key – and they take time to find. Midway through one account, my eyebrows peaked at the line “One Monday, during her second year of psychoanalysis,” particularly as Grosz has already told us that many patients will be seen five days a week. Another, a man living with HIV, sleeps through most sessions for three years. This is a time-consuming – and presumably expensive – quest. Not incidentally, one of the pleasures of The Examined Life is Grosz’s literary understanding: he brings relevant writing to bear on the subjects, from Beckett’s Endgame to Melville’s Bartleby. It’s fitting that Grosz’s agent said in his letter submitting the book to publishers, “Think Carver, Cheever, Calvino, not Freud, Lacan, Jung.” If it is not quite true to say that literature has a civilising influence, then at least we know it can provide signposts through the thickets, with a little help from one who knows. * strictly, the term is analysand. Let’s stick with patient. How I agree with the section you have quoted on attentiveness and the comparison Grosz makes between random praise and real engagement. It’s very easy when we’re tired or bored just to give half attention to a child and it’s so rewarding for us and the child if we give our full focus – if only for a few minutes. It worries me that I often notice young mothers and fathers in London who talk on their phones continually and pay no heed to their children who are often busting to make observations and ask questions. Your final comment about literature providing signposts through the thickets encapsulates why reading is so important for me. Some fascinating insights into the human mind there, especially about attentiveness, paranoia, splitting and praise. It’s so easy to give other people less than full attention in today’s hectic world. Definitely on my to-buy list. Thanks for this. I’ll look up the book. Have you seen the Israeli series Betipul John? I appreciate it’s unlikely, but you might like it if you can seek it out. It was remade in the US as In Therapy, but everyone looked a lot more attractive and the original is strongly dependent on the cast so I never checked out the remake. It’s a nine week series, five half hour episodes a week. Each episode is a therapy session, so each Monday episode is that patient’s session, each Tuesday is a separate patient’s session, and so on with the Friday being the therapist’s own therapy. I loved it in part because it made gripping drama without needing to shoot everyone, which sometimes just seems so easy. It’s curious how literature can make a struggling marriage a thing of great drama, while TV and film so often need to kill someone to achieve the same effect. A question of laziness rather than limitations of the media I think. I would never have considered this. However, given it’s you and how few books you’re presently recommending, I’ll check it out. That Mavis Gallant advice is interesting. I should bear that in mind. I tend to overdose on short stories, reading too many together at once. Out of passing interest, which were the books on that chain of much-touted new releases? The public have a right to know! I think I have put this book on my ‘to read’ list and taken it off again about half a dozen times. I think I was worried it might be too obtuse or indulgent. Your review now has it firmly back on my list. Many thanks. I bouht a copy and am two stories in John. In line with your advice/suggestion, I’m reading only one each day although it would be very easy to just gulp them down. Still, I can see that the effect would be lost. Acorn, it’s not remotely obtuse. I hope you like it. Max, I have genuinely forgotten some of the books I read before this (which was after the turn of the year; it just took me a long time to get around to writing about it). Most I didn’t finish and there’s not much point in my commenting on them in any event. Cheers for an interesting review. I’m enjoying this, but I don’t see it as enlightening or a major literary work. It’s interesting though. My main concern presently is as to his conclusions. That someone behaves a certain way now, and had a particular experience as a child, doesn’t mean that the behaviour is a product of the experience even if one can craft a narrative connecting the two. It reminds me a bit of evolutionary psychology in that. Just because we can craft a tale showing how a present behaviour might have been selected for due to certain circumstances, doesn’t of itself mean that it was so selected for or that those circumstances did prevail in that way. It’s a narrative, a story which may be useful but which is inherently unreliable due to the lack of any external correlating evidence. I agree with this as a potential flaw of the psychoanalytic method, Max. In fact, I very briefly touch on it in my review. I think Grosz spins a neat narrative and he’s very good at creating those links in a succinct and clear way. But, as you say, there’s more than a little speculation there. Matthew, at risk of abusing John’s hospitality could you link me to your review? I’m curious to read a second opinion. I suspect I may be ending somewhere between the two of you. Some stories do hit like a punch in the gut (a cliche I’ll strive to avoid when writing my own review in due course). 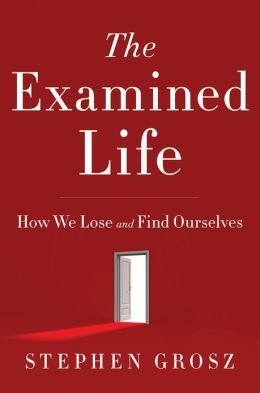 Max, you can find my review here: The Examined Life by Stephen Grosz – doubtless, it is far less comprehensive or articulate than John’s, but I hope it’s of some use. Do let me know when you’ve put up your own post (I’m quite happy for you to drop a link in the comments on my review). It’s always interesting to read what other people have made of a book, and this is one of those where I feel out of step with the majority, so perhaps even more eager to read alternative opinions. Negatives aside – it does feel a little self-help like (as much from the marketing and chapter titles as anything else, something I assume Grosz was advised on? ), the examples are often very neat, and work against his later ideas of closure – I can’t think of another book that left me feeling so naked and vulnerable. I finished it in a cafe in Earl’s Court (enough to make anyone cry) and found myself shielding my eyes from my fellow customers. I completely forgot to say that this was a great review! Cheers John. Try “Loves Executioner” by Yalom. Same flavor – I’ve read it several times and am always surprised by his humility in writing about his clients. Thanks – I will look out for it. I postponed reading this book for a long time. I have been reading it for the last three days and all I can say is that I feel as if I have just awaken an internal kraken.